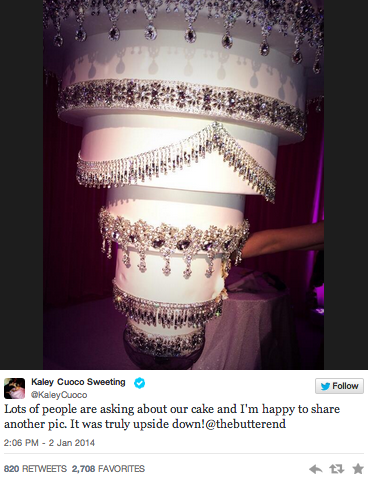 Kaley Cuoco takes the cake! "Big Bang" star, Kaley Cuoco, had an unusual wedding cake at her New Year’s Eve fire-and-ice themed nupitals. It was a 6-tiered, two-flavoured wedding cake dripping in intricate crystal designs hanging UPSIDE DOWN from a chandelier. WOW! The Butter End Cakery in LA created this unique masterpiece which even garnered an additional tweet from Cuoco. I wonder if this will set a new trend in the world of wedding cakes….